Captain Ty Wiltz normally oversees the narcotics division of the Plaquemines Parish Sheriff's Office. 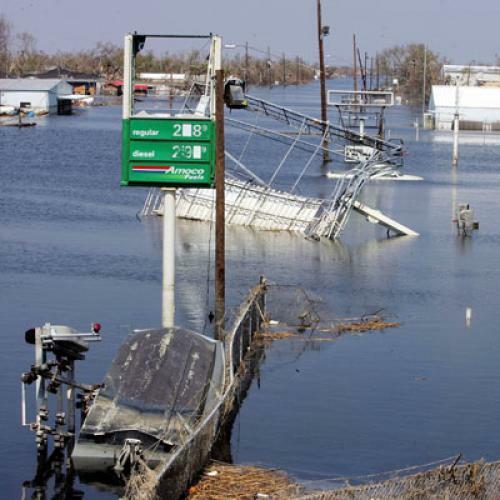 But, since Katrina hit, he has been leading a search and rescue team deep into the parish bayou, which begins just south of New Orleans and runs nearly 100 miles to the Gulf of Mexico. "It's a far cry different than searching for dope," he says as the team sets out early Tuesday morning from Belle Chasse High School, which has been turned into a makeshift base for the sheriff's department and a contingent of soldiers from the New Mexico National Guard. While national attention has been focused on the fate of New Orleans, it's really places like Plaquemines Parish that are likely to vanish from the map. There's little doubt that the Big Easy, with some of its neighborhoods and infrastructure still intact, will be rebuilt. The same doesn't go for Plaquemines, a sparsely populated--with 845 square miles, it has only 28,000 inhabitants--but tightly knit swath of towns. "Ninety-nine percent of these people are related," Wiltz says of the residents of one particular town. Although most of them were lucky enough to leave before the hurricane, given the extent of the devastation, they are unlikely to return. The storm's environmental impact affects their lives on the basest economic levels. Many of the locals work as fishermen, but now the Mississippi and its bywaters are so polluted that some say it will be years before any wide-scale fishing can resume. Almost all of Wiltz's five officers, who lived in the parish's isolated settlements, lost their homes, and they all say they will move away. Wiltz says the federal government will likely buy a lot of the land, and its residents will join the diaspora currently underway, relocating to other parts of southern Louisiana or even out of the state. Wiltz is short and stocky, with close-cropped strawberry blond hair and a commanding voice. On patrol, he wears white rubber boots, a yellow straw hat, a shotgun slung over his shoulder, and a pistol holstered to his belt. He twirls an iron rod, which he uses to knock in windows and pry open doors. He hops into the passenger seat of a white county coroner's van and tells the driver to head south on a state highway that runs along the Mississippi. Two transport trucks and a school bus filled with National Guardsmen, plus two cars of sheriff deputies, follow behind. Soon the industrial suburbs that make up Plaquemines's northern corner recede, and we enter the areas hardest hit by Katrina. It's easy to see why people don't imagine themselves coming back. Caskets, lifted by the storm surge from their graves, litter the highway. Dead animals--cows, elk, dogs--lie by the side of the road, rotting in the hot sun. Birds circle overhead. "When they did a flyover just after the storm, they saw these animals and thought they were dead bodies," Wiltz says. Huge barges sit perfectly arranged atop levees, where the water's surge had deposited them. "Three days ago, this was totally flooded," he says, adding that, until a few days ago, the searches had to be conducted by boat. "The only way to navigate was by going from telephone pole to telephone pole." The grass along the road is covered in a thin film of dried ooze, and the air is thick with the putrid odor of decaying fish and raw sewage. Every once in a while, a truck from one of the many oil companies located in Plaquemines drives by. Otherwise, the bayou is empty. So far they have rescued 53 people, Wiltz says, though they have also found three bodies. Nevertheless, each house has to be searched and marked with spray paint--a green circle means it is empty, a red circle means it contains a body. "Let's use up all this green paint," says one of Wiltz's men as they head into the first group of houses, a knot of single-wide trailers lodged between the highway and the levee. They shout, "Sheriff's Department!" as they pry open the trailer-home doors and comb through the wreckage inside. While they work, the men talk about their overturned lives in matter-of-fact tones. "My kids are in Baton Rouge, and they start school today," says Wiltz. "Have you seen my house?" asks one of his deputies. "All I've got is the frame from my garage door, and the roof's on [Highway] 23. Romy Treadway's house is in a tree." After 20 minutes, the houses are all circled in green, and they move on. The search column inches down the highway and back roads, stopping every half-mile at a new cluster of homes and, in one case, a small Catholic church. The chapel is calf-deep in mud and twigs; the communion dais has been swept from the front of the sanctuary and now sits on the back pews, topped by a Virgin Mary statue on its side. Wiltz, who worked in his family's auto-parts store before joining the department, started out patrolling tiny Diamond, Louisiana, just south of the church. "Diamond's gone," he says. "It's all wiped out." Like Diamond, many of the towns in Plaquemines Parish will likely cease to be, their residents surrendering their homes--and even family pets--to nature. Loud bangs occasionally ring out, as Wiltz and others shoot dogs they find among the houses, scared, sunburned, and dehydrated. "I had to put him out of his misery," Wiltz explains remorsefully, after shooting a dachshund. Wiltz is also thinking of his men--he has already seen dogs roaming in packs, and he is worried that they might attack. We stop for lunch along the highway: MREs and bottled water. Some of Wiltz's men have already gone ahead, perhaps anxious to see more of the parish where most of them have spent their entire lives. The plan had been to clear houses until 3 p.m., but Wiltz announces that he has decided to call it a day. "We've run out of green paint," he says.